William Shea points to the establishment of the National Association of Evangelicals by Harold Ockenega in 1942 as marking the beginning of a shift of attitude towards Catholics, moving beyond the polemical discourse of earlier evangelical fundamentalists.2 Most important was the Second Vatican Council, which recognized that the Church of Christ is bigger than the Catholic Church and assuaged evangelical political fears by affirming the principle of religious liberty. Articles about Catholics in the flagship Evangelical magazine, Christianity Today, changed from suspicious and antagonistic to a more irenic tone.3 As the Catholic Church moved from rejection of the ecumenical movement to engagement, dialogue with Evangelicals was soon to follow. On the international level, Rome has been in dialogue with Pentecostals since 1972, with Evangelicals since 1977, and with the World Evangelical Alliance from 1993 to 2003. The dialogue has not always been easy. Finding ways to relate to dialogue partners who represent “streams” or “movements” rather than churches is challenging. The initiative for the dialogue between some classical Pentecostals and the Catholic Church came from one of its founding cochairs, David du Plessis (see callout in “Fuller’s Ecumenical Vision”), who was to pay a heavy price for his ecumenical involvement. A member of the Assemblies of God, his ordination credentials were withdrawn in 1964, though they were restored in 1980. Some Pentecostal members, not officially delegated by their churches, have had to come at their own expense. The dialogue, cochaired by Fuller Seminary’s Cecil M. Robeck Jr., is due to begin its sixth round . In the United States no Evangelical or Pentecostal churches or association have been willing to enter into dialogue with the United States Conference of Catholic Bishops. The Southern Baptist Convention began a rather tentative “conversation” in 1995 but decided unilaterally to end it in 2001. An unofficial but significant consultation, “Evangelicals and Catholics Together” (ECT), was established by Charles Colson and the late Richard John Neuhaus in 1992. Though the consultation brought some high-profile Evangelicals into the dialogue and is quite sophisticated theologically, it has been controversial. The chairman of the Alliance of Confessing Evangelicals said that its 1997 statement, “The Gift of Salvation,” “really sells out the Reformation.”4 Mainstream Catholics are concerned that ECT tends to focus on those moral and social concerns shared by Catholic neo-conservatives and the religious right. The first local dialogue in the United States between Catholics and Evangelicals was established in 1987, sponsored by Fuller Theological Seminary and the Archdiocese of Los Angeles.5 Since its beginning, the Los Angeles Catholic/Evangelical Committee has addressed issues of tension and common interest between the two communities, among them evangelization and the Hispanic community, Mary and the saints, the Evangelical-Roman Catholic Dialogue, social justice, as well as revelation and authority, and it has sponsored various events bringing the two communities together at local or congregational levels. One event focused on worship in both traditions, another brought Catholic priests and Pentecostal pastors together for conversation. In May 2009 Fuller Seminary invited Cardinal Roger Mahony to speak on immigration. Most importantly, from the dialogue over the years have come enduring friendships that have brought Catholics and Evangelicals together in a number of new initiatives. In Latin America where tensions between Catholics and Evangelicals go back to the sixteenth century, exacerbated by the “Black Legend,” a collection of myths demonizing the Spanish and the Catholic Church as well as by state privileging of Catholicism in many Latin American countries. But much of that is gone today; the region’s growing religious pluralism has led to an increasing emphasis on the separation of church and state. More positively, while many Evangelicals in Latin America remain suspicious of ecumenism, there are some signs of Catholics and Evangelicals, particularly Pentecostals, taking tentative steps towards each other. In 1989 the ecumenical commission of the Episcopal Conference of Chile invited Chilean Pentecostal Juan Sepúlveda to participate in a discussion on “Pentecostalismo, Sectas y Pastoral,” leading to a commitment from the Catholic bishops to refrain from derogatory comments about Pentecostals and to begin working toward better relationships. In 1997 Sepúlveda received an invitation to attend the Synod for America as a Pentecostal observer, and in 2007 he gave a plenary address to the bishops of Latin America when they gathered at Aparcida, Brazil, with Pope Benedict XVI for the Fifth General conference of the Latin American Bishops (CELAM). Still, the first meeting between Catholics and Pentecostals in Brazil did not take place until 2008. In the United States, relations are much more positive. What this means is that a new generation is emerging much less burdened with the prejudices of the past and more accustomed to working together. Some examples: It is not unusual to find evangelical students enrolled in Catholic graduate programs today, or Catholic students at more progressive evangelical seminaries like Fuller. The Academy of Catholic Hispanic Theologians (ACTUS) has brought Catholic and Protestant Hispanic theologians together, many of them Evangelicals, as has the Hispanic Theological Initiative at Princeton. Some Evangelical institutions like Fuller, Azusa Pacific’s Haggard School of Theology, and Vanguard University are ahead of Catholic graduate schools in developing “academic bridge programs” for first-generation Hispanic pastoral ministers, Catholics among them. A dean at Haggard told me several years ago that their Catholic students generally know their theology, but not the Bible, while the Evangelical students are in the opposite position. But together they learn from each other. On some campuses, Catholic campus ministry offices cooperate with InterVarsity Fellowship in developing programs for evangelizing and serving students. In 2002 Wheaton College held a conference bringing Catholics and evangelicals together with speakers such as Mark Noll, J. I. Packer, Richard John Neuhaus, and Cardinal Francis George, Archbishop of Chicago. One of Wheaton’s graduates, John Green, a Catholic deacon, has begun Emmaus Ministries, which brings Catholics and Protestants together in an effort to reach out to men involved in prostitution, many of whom have been sexually exploited themselves. In Los Angeles, Brian Warth, a former juvenile offender who is now an Evangelical pastor, regularly works with Jesuit Father Michael Kennedy in a restorative justice initiative. Unfortunately, this kind of common ministry is too often exceptional. And while there are many social issues on which Catholics and Evangelicals have common interests, it is rare to see their bishops and church leaders working and praying together. There are still significant theological differences between Catholics and Evangelicals. Evangelicals point to issues such as Catholic teaching on baptismal regeneration, the role of merit, the Mass, Mariology and the invocation of the saints, purgatory, and papal infallibility. Catholics have difficulty with the tendency of Evangelicals to turn the Reformation Scripture principle into an absolute warrant for private interpretation, unmediated by tradition or Church,6 leading to the incredible proliferation of denominations in American Protestantism, to an exaggerated concept of biblical inerrancy, claiming an infallibility for the biblical text that Catholics wouldn’t dream of attributing to the pope, and to significant differences in the theology of the Church, too often reducing the universal Church to an invisible, spiritual, or eschatological reality and the real Church to the local congregation. Evangelical theology has paid little attention to ecclesiology, as some evangelical theologians readily acknowledge. Donald Bloesch speaks of their “appalling neglect of ecclesiology,”7 while Timothy George argues that Evangelicalism “is called upon to set forth a clear, compelling ecclesiology in the light of new conversations and developing relations with their Roman Catholic brothers and sisters.”8 Recently two fine Evangelical works on ecclesiology have appeared, Miroslav’s Volf’s After Our Likeness and Veli-Matti Kärkkäinen’s comparative study, An Introduction to Ecclesiology. Ecumenism always begins in friendship. Often it leads to mutual respect, to learning from each other, and to working together, “that the world may believe” (John 17:21). Characteristic of a new relationship between Catholics and Evangelicals was Evangelical scholar Tim Perry’s 2007 edited volume, The Legacy of John Paul II, an appreciative assessment of the pope’s encyclicals and apostolic constitutions.9 To see fourteen Evangelical scholars wrestling in a critical yet substantive way with the pope’s, and thus Catholic views on evolution, the Eucharist, Mariology, pneumatology, human life issues, social justice, Christian colleges and universities, as well as papacy and infallibility in a reunited church, is clearly a sign of hope. 1. Edward L. Cleary, “Report from Santo Domingo—II: John Paul Cries ‘Wolf’: Misreading the Pentecostals,” Commonweal, November 20, 1992, 7. 2. William M. Shea, The Lion and the Lamb: Evangelicals and Catholics in America (Oxford: Oxford University Press, 2004), 174–75. 3. Mark A. Knoll, “Evangelicals and John Paul II,” in The Legacy of John Paul II: An Evangelical Assessment, ed. Tim Perry (Downers Grove, IL: InterVarsity Press, 2007), 27–28. 4. Cited in Christianity Today, April 27, 1998, 17. 5. See Thomas P. Rausch, “The Los Angeles Catholic/Evangelical Dialogue,” Ecumenical Trends 26, no. 6 (1997): 13–96. 6. See D. H. Williams, “The Search for Sola Scriptura in the Early Church,” Interpretation 52, no. 14 (1998): 358. 7. Donald Bloesch, The Future of Evangelical Christianity (Garden City, NY: Doubleday, 1983), 127. 8. Timothy George, “Toward an Evangelical Ecclesiology,” in Catholics and Evangelicals: Do They Share a Common Future? ed. Thomas P. Rausch (New York: Paulist, 2000), 123. 9. Tim Perry, ed., The Legacy of John Paul II: An Evangelical Assessment (Downers Grove, IL: InterVarsity Press, 2007). 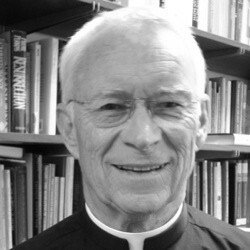 Thomas P. Rausch, SJ, is the T. Marie Chilton Professor of Catholic Theology at Loyola Marymount University in Los Angeles, CA. A specialist in ecclesiology, he has published seventeen books and over 220 articles and reviews, including “Who Is Jesus? An Introduction to Christology” (2003), and “Pope Benedict XVI: An Intro-duction to His Theological Vision” (2009). He served on the Catholic/Southern Baptist Conversation (1995–2001) and the Catholic/World Evangelical Alliance Consultation (2001–2003). He is a member of the Angli-can/Roman Catholic Consultation USA, cochairs the Los Angeles Catholic/Evangelical Committee and the Theological Commission for the Archdiocese of Los Angeles.